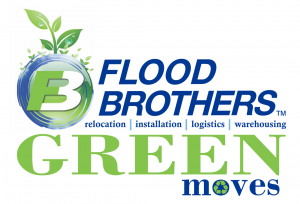 Green Moves is a Flood Brothers program which implements methods to reduce negative impacts on the environment while lowering costs associated with conventional moving and installation services. The Green Moves philosophy of “less is more” is proven to be true when using its methods and materials to pack and protect your company’s building, office furniture and content. 98% of ALL materials used on a certified Green Move will be reused over and over again for years before it will be recycled. Sustainable efficiency means achieving the same results while using lower resources and less labor. Crates are larger than boxes and you can pack them full without fear of damages due to weight when stacking. Therefore, you will need 20-50% FEWER crates than boxes. This will also reduce the number of truckloads needed to transport your goods by up to 40%. Flood Brothers can assess your waste issues prior to your move and develop a plan to reduce the environmental footprint of your company. We can then certify these findings for your company’s ecological portfolio. This can be essential whether your goals are to demonstrate good stewardship to your clients or to document these efforts in order to achieve LEED Certification.